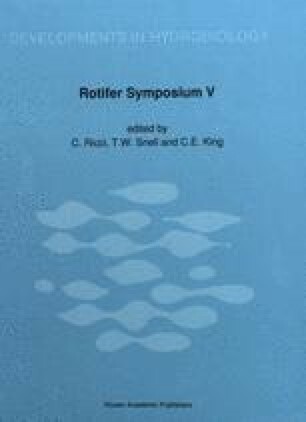 Seasonal and vertical occurrences of representative rotifer species were recorded together with such taxa as Cyanophycea, Phytomastigophorea, Bacillariophycea, Protozoa, Rotifera and Crustacea, from 1982 to 1986 at two sites S1 (natural) and S2 (nearby water circulated since 1952). 1) The following species were observed from S1: K. hiemalis, C. ovalis, N. labis, L.patella and Anuraeopsis sp., from S2: B. urceolaris and A. ecaudis, 2) P. hudsoni appeared in 1984 as a successor to P. truncatum, 3) K. longispina was negatively associated with P. t. vulgaris, 4) Synchaeta spp suddenly appeared at both sites in 1985, 5) K. cochlearis, B. calyciflorus, Proalides sp., Diurella sp., N. labis, B. urceolaris and bdelloids did not appear until 1986, 6) The following species decreased or disappeared: A. p. herricki and Collotheca sp. since 1982, C. coenobasis, C. hippocrepis and K. hiemalis since 1984, 7) A complicated relation was observed between rotifer population density and other plankton. 8) Occurrence of Rotifera seemed to be affected by circulation of an electric power plant.